The existing Fire Hall on Grafton Road was constructed in 1969 on donated land, with an addition built in 1977. It was a welcome upgrade from the Island’s first ladder truck, a 1928 model acquired in the 1950s and housed in a woodshed on the site of Bowen Court. The Fire Hall Facilities Steering Committee (“the Committee”) has been working on this critical infrastructure challenge since 2001, after a seismic study found the current facility to be at risk of collapse. The process since then has been long, complex and thorough, and the Committee has persevered through changing Councils with largely a consistent membership. Considerable research and expert opinions have been amassed and carefully considered, with outstanding dedication of team members along the way. Now, in 2017, an important milestone has been achieved: Council’s decision to locate a new Fire Hall and Emergency Operations Centre on Miller Road (Lot 3 of the Community Lands). Prior to selecting the Lot 3 site, the Committee looked at possible locations within the Community Lands, which are the three parcels of municipally-owned land purchased from Metro Vancouver. No other development has yet taken place on these lands. The Committee first reviewed potential sites on both Lots 1 and 2, but ultimately rejected these. Steeply sloped Lot 1 required prohibitively expensive site preparation, and a Lot 2 location would have meant buying additional land for road access and building a new road—again, at considerable cost. Lot 3 on Miller Road offers a flat site with ready access, needing only minimal preparation. As well, it is near to both Ambulance and RCMP stations, for easier collaboration among first responders. The identified portion at the north end, has the best sightlines for safe movement of fire apparatus on and off busy Miller Road. 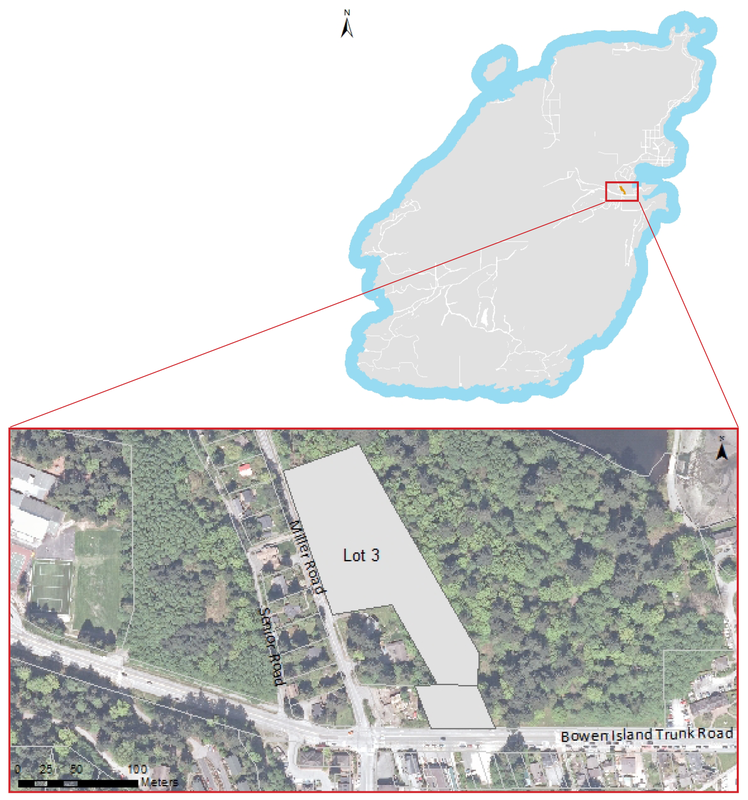 As an additional benefit, the Miller Road site brings Bowen Island’s entire population within 8 kms of a fire hall, and thus within acceptable insurance standards for rural fire protection (and resulting in lower insurance costs for affected homeowners). The site is not considered to be environmentally sensitive, nor is it within Crippen Park boundaries. As well, this location is already served by Cove Bay water and sewer. Overall, the north section of Lot 3 emerged as the best option: the most convenient and least expensive place to build, on a location closest to most homes and businesses. The minimum size of the site was determined by the fire apparatus to be housed in the facility, the turning radius required for those vehicles, and the number of parking spaces needed to accommodate the full membership of the BIVFD. It is also noted that the land required is smaller than it otherwise would be, because no additional space is required for outdoor training. Outdoor training now takes place at the Satellite Hall on Adams Road. Formally securing this location for a new Fire Hall required an amendment to the Official Community Plan (OCP) designation for this section of Lot 3, to allow for “institutional use,” in addition to the previously designated ‘residential.’ Amendments were also made to the Land Use Bylaw, to place the land in the Village Civic Zone. This zone allows for institutional uses such as Fire Hall, Police Station, and Ambulance Hall, as well as accessory residential use. With few public objections to the site, and considerable support from residents who are currently outside the 8 km threshold, the selection Lot 3 was approved by Council on January 23, 2017. The rezoning is now complete, and the Fire Hall will be built at this location.